CUPERTINO, CA (PR Buzz) – February 20, 2019 – – Every person exists with a purpose, but not everyone happens to know how to live a life of purpose. People tend to put fear above faith all throughout their life successes and downfalls. Most, if not all, opt to settle on a conventional, convenient, and easy way of life. This is not wrong unless it leads to a passive and futile life. Napoleon Hill's book, "Outwitting the Devil," contains deep thoughts about how to deal with the negative forces that drag people to fail, eventually leading them to fear and a life without purpose. This controversial book also contains wisdom about life realities that people generally ignore but are essential in pursuing a life with direction and purpose. Whether you are someone who has yet to find a meaning to your life, someone who has the determination to live with a purpose, or someone who is a mentor to people needing help about various life dealings, this AHAbook® is right for you. The 140 AHAmessages® from this book are straightforward and easily shareable to friends, colleagues, partners, and family members. People from various walks of life can truly relate to and reflect on these AHAmessages, each giving away impactful insight about being focused on how people should live their life the way they perceive it to be: a life of purpose amidst failures. 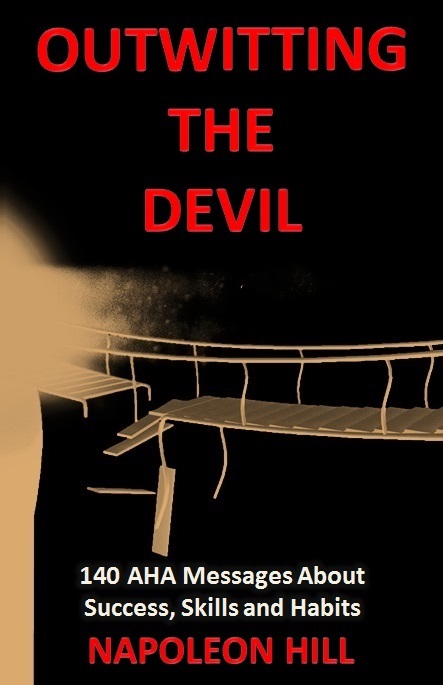 It is through this book where readers can gain a deep understanding of the power of the mind to overcome life challenges and be physically, emotionally, mentally, and spiritually free from the so-called devil's traps. "Napoleon Hill is a legend when it comes to enlightening people about life's ups and downs. This book, 'Outwitting the Devil,' is a result of his passion to help people see failures as weapons to achieve personal success," says Mitchell Levy (http://aha.pub/MitchellLevy), Global Credibility Expert and The AHA Guy at AHAthat® (https://AHAthat.com). Read and share AHAmessages in this AHAbook on Twitter, LinkedIn, and Facebook by going to http://aha.pub/OutwittingTheDevil.